Who’s a little Blood Sucker then? Following on from yesterday’s thoughts about bats, I have to add that there are, of course, blood feeders among the bat populations which, although considerably smaller than the bat-monster in Willow the Vampire and the Sacred Gove, can still pack quite a punch – or should that be “bite”? Vampire bats have needle sharp teeth which enable them to pierce the skin of much larger prey, mainly cattle and horses. The vampire bat leaves its cosy roost at night to hunt for sleeping victims. Once found, the victim probably won’t even notice the incision made by the bat’s razor-sharp teeth. Vampire bats also have a clawed thumb, enabling them to grip very tightly, when they climb around on their – compared to their own tiny bodies – gigantic prey. The vampire bat then uses its grooved tongue to lap up “the juice of life”. Among the largest of the bat species is the utterly harmless fruit-bat, or flying fox, which uses its sonar and its keen sense of smell to locate yummy fruit, pollen and nectar. 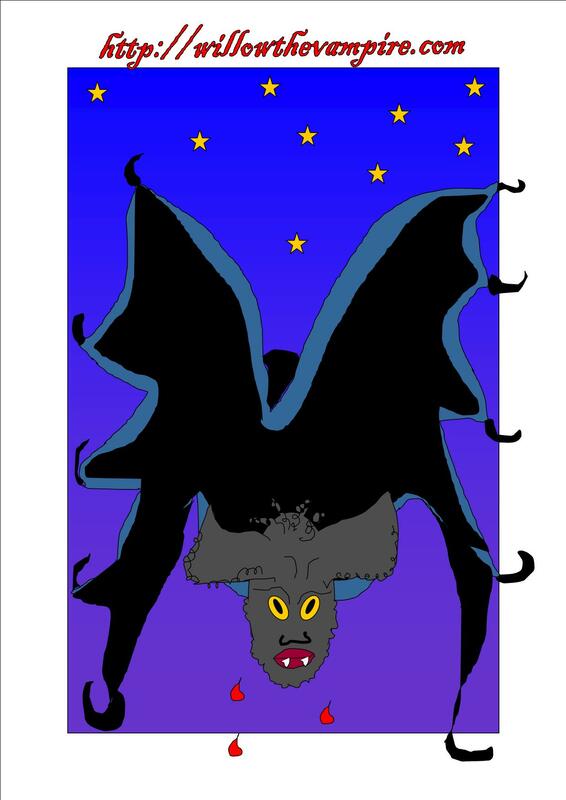 None of the bats in nature grow as large as the vampire-turned-bat creature in my novel, though – which will come as rather a relief to my readers and Willow the Vampire herself, whose encounter with cruel Mr Hartmann will stay with her for a long time to come! Female bats raise their pink, initially naked babies in special nursery roosts, where young bats snuggle up to one another, while their mums are away on hunting trips. Bat mothers returning to the nursery roost will identify their offspring by the sound they make, which is unique to each individual baby bat – which brings us full circle to yesterday’s blog about bat music, the echolocation bats use to navigate in the air and find their prey.